In the case of shunt reactors the current to be interrupted are very low (typically less than few hundreds amperes) compared with the breaking capability of the circuit breakers: they are often referred to as “small inductive currents”. After opening of the circuit breaker, the current flows through the arc between the contacts. This arc is stable at high currents, but in the case of small inductive currents it is not and it is very common that the current is interrupted prior to the natural current zero (current chopping). The resulting chopping overvoltage (also called suppression overvoltage), and particularly overvoltages due to subsequent re-ignitions, may be a concern. These overvoltages take origin from the electromagnetic energy stored in the reactor inductance at the instant of chopping. The following picture shows a single-phase model of the system in subject, complete enough for the purposes of this paper. being U the rated voltage of the system, including the reactor. Inductance and capacitance to ground of the source side of the system are represented by Ls and Cs respectively. The parallel capacitance Cp is a parameter of the circuit breaker. Normally Cs >> Cp. The reactor is represented by its inductance L, the stray capacitance CL and the inductance of its connections up to the circuit breaker Lb. Even if not shown, both connections and reactor have their resistive part producing the damping effect which will be evident in the plot of current / voltage. and voltage does never exceeds the maximum system voltage. It can be shown that for air blast, oil and SF6 circuit breakers, the chopping current is proportional to the square root of total capacitance seen from the circuit breaker terminals. In the circuit in subject that is given by the parallel of Cp with the series of Cs and CL. Where N is the number of interrupting chambers per pole. Chopping number λ is a characteristic of the circuit breaker and can be assumed to be a constant for different types of circuit breakers, except for vacuum circuit breakers. When the oscillating voltage on reactor reaches the opposite peak (after half a cycle), the consequent peak recovery voltage could exceed the dielectric withstand capability not yet fully recovered, so leading to reignition. A re-ignition will generate high-frequency transients, typically hundreds of kHz, in both the reactor voltage and the current through the circuit breaker. The interval between succeeding re-ignitions increases as a consequence of the progressively increased withstand capability of the insulating medium, each time able to withstand major recovery voltages. The difference between source and load side voltages immediately before each re-ignition increases time by time and so the overshoots when re-ignition occurs. But the potential danger for the reactor actually comes from the steep voltage transient that is imposed on the reactor at each voltage breakdown associated to a re-ignition. In fact steep front voltages may be unevenly distributed across the reactor winding, stressing the entrance turns in particular with high interturn overvoltages with consequent risk of winding insulation puncture. The steepness is determined only by the frequency of the second parallel oscillation circuit, which in its turn depends on the circuit layout. Differently, the first suppression overvoltage is associated with relatively low frequencies, so the relevant voltage stress is evenly distributed and is somehow more acceptable. Shunt reactors are normally protected by surge arresters, which will limit overvoltages to earth to acceptable levels. 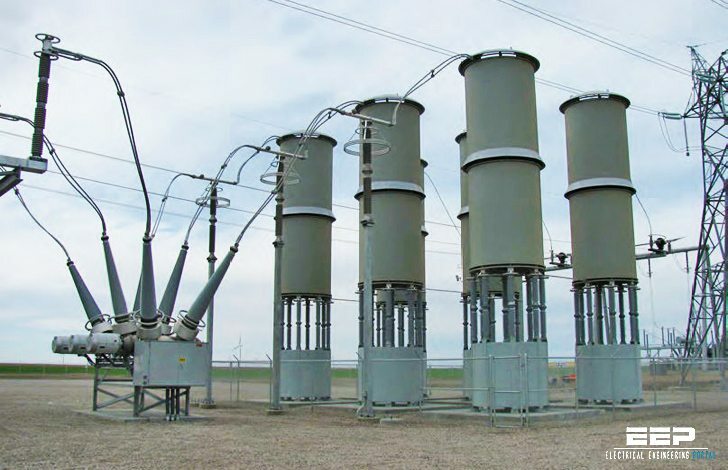 But arresters cannot reduce the steepness of the voltage swings associated with re-ignitions. Actually the way to effectively limit voltage stresses on reactors passes through avoiding re-ignition. suitable forused with controlled switching devices. Mechanical endurance class M2 and electrical endurance class E2 are recommended, especially for frequently switched reactors (which is the case of shunt reactors associated to renewable power plants or to HVDC converters). 3 Contacts are not parted close to the instant of maximum phase-to-earth voltage, corresponding to the minimum of current, as one could expect, but around the instant when voltage is zero. In this way the current is high enough to produce stable arc for a sufficient time letting the gap between contacts be large when the low current will be chopped. An optimal arcing time is in the range 4-7 ms.